Hindu's biggest festival of the year, Navratri/Durga puja is just around the corner and I just can't control my excitement. While North Indians celebrates Navratri for 10 days, us Bengalis celebrate Durga puja for 5 days with full enthusiasm and zeal. Durga puja is celebrate to welcome Divine power Goddess Durga with her full family in our abode for 5 days. In 5 days we live our lives to the fullest forgetting all teh problems of our lives. Actual excitement starts almost 2-3 months prior the festival, buying new clothes for the festival for the family and relatives, cleaning the house, make new paints on the wall- all these are part of the festival. Another thing that is very much part of celebration at my home and also in almost all bengali households is menu planning for all the 5 days of festival. 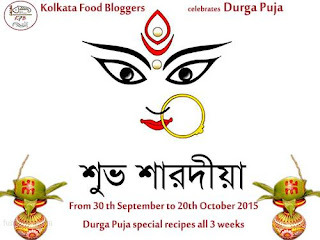 If you want to know how Bengalis celebrate Durga Puja, then go thru my previous posts below. A blogger group I belong to, i.e., Kolkata Food Bloggers has also organised a "Durga Puja" festive event for the upcoming Durga Puja. Click on that link to check more such Veg and non-veg delicacies from allover the World. 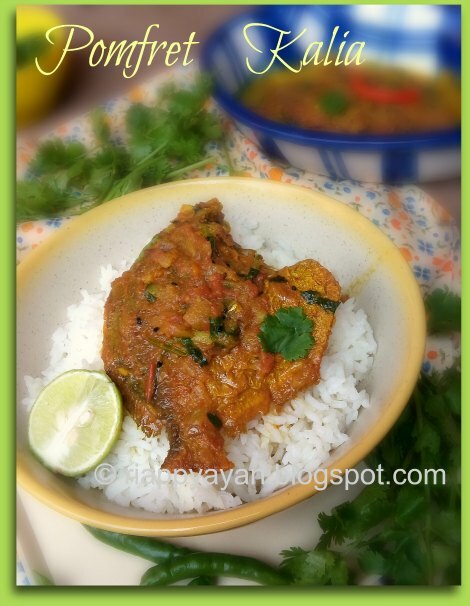 For today's recipe I choose to post a fish delicacy from Bengali Cuisine. 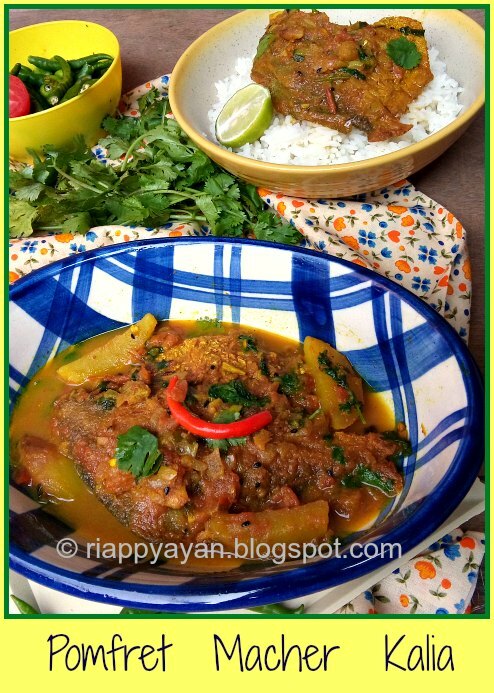 The star ingredient or the fish of this recipe is everyone's favorite Pomfret Fish. This is one amongst many sea fishes that contains relatively high nutritional value. It is cited to be used in traditional Chinese medicinal due to the fact that it promotes healthy skin along with digestive health benefits. It may be considered good for your skin for its high vitamin A, vitamin B3, and vitamin E content; which give you what you need to fight off wrinkles, skin redness and maintain moisture in your skin. 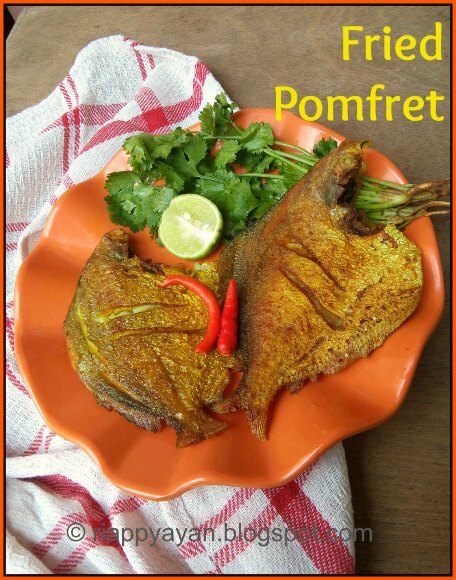 Sliver Pomfret is an excellent source of B vitamins including vitamin B12 and Niacin. Because of its high nutritional value, the price is quite high all the time. But Bengalis never think of prices when it comes to fish, specially during festive times. 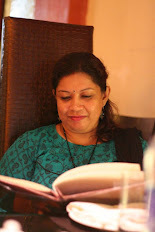 Therefore, the recipe I'm sharing today is often cooked in special occassions or festive time in Bengali households. This is a very common fish preperation of fish in Bengali Cuisine which we call as Kalia. 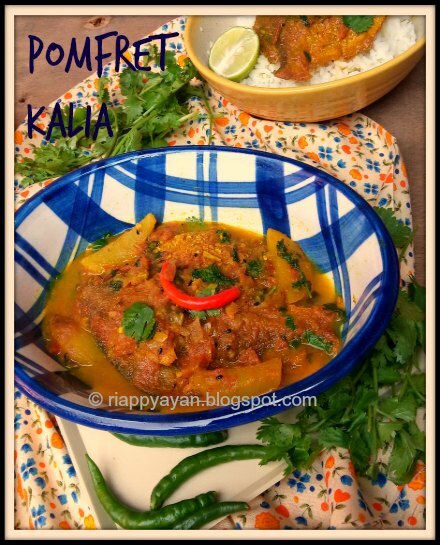 Kalia is a Bengali cooking term which means a very rich preparation of fish, meat, egg even vegetables, using a fair amount of oil and ghee with a sauce usually based on ground ginger and onion paste and finally with a sprinkle of bengali Garam masala(a grounded powder of cinnamon, cardamom and cloves). Black Cumin/kalonji/Kala jeera : 1 tsp. Wash and clean the fish well. Then marinate them with 1 tblsp. turmeric powder and 1 tsp. salt. Rub all over the fish and keep aside for at least 1/2 an hour. Make a paste of Ginger and 1 green chilli. Heat enough oil in a flat frying pan, place the marinated fish one or two at a time(do not overcrowd the pan) and fry them in medium heat from both sides until they are well browned. Remove and keep aside the fried fish. Heat 1 tblsp. oil in another pan or kadhai, temper the oil with black cumin and 1 green chilli slitted from the middle. When seeds crackle, add finely chopped onions and grated garlic, mix well and saute them for couple of minutes. Then add ginger and green chilli paste and again mix thoroghly with onions. Mix turmeric, red chilli, cumin powder and a pinch of salt with 2-3 tblsp. of water. After sauteing above onion-ginger-garlic for 1-2 minutes, add this spice mixture. In medium-high heat, saute the spice paste till oil seperates for about 2-3 minutes. Now add chopped tomatoes in there and again cook until tomatoes get mixed in the spice blend well and oil seperates the masala(spice blend). Season with salt and add sugar now. Mix well and add 1 cup warm water in there. Cover with a lid and cook for about 7-8 minutes in medium heat or gravy thickens. I didn't cook till gravy thickens, kept a little thinner gravy, but it's upto you. Both the version has its own taste. Check teh seasoning before you remove the pan from heat. Lastly garnish with fresh coriander leaves. Serve with plain rice..........tastes just awesome.